Rg. 225 Pleomorphic adenoma: hyaSne cells. Rg 227 Pleomorphic adenoma: multinodular recurrences. 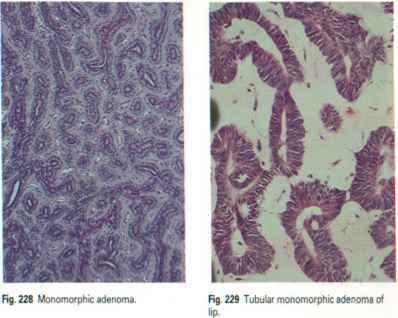 These have a uniform pattern often of trabecular or ductular pattern (Figs 228 & 229) and lack the conncctivc tissue components of pleomorphic adenoma. There arc several subtypes. Adenolymphomas form about 10% of salivary' gland tumours but virtually all arc in the parotid gland and about 5% are bilateral. Intra-oral glands are probably never affected. This tumour is mostly seen in middle-age and typically forms a soft or cyst-like mass in the lower pole of the parotid. Microscopy The two components arc glandular epithelium and lymphoid tissue (Fig. 230). 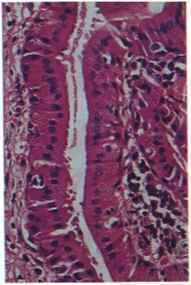 Tall, columnar, eosinophilic epithelial cclls (Fig. 231) surround and protrude into cystic spaccs and cover lymphoid tissue consisting of small lymphocytes and, usually, germinal centres. The tumour is benign. Rg. 231 Adcnolymphoma: epithelial component. 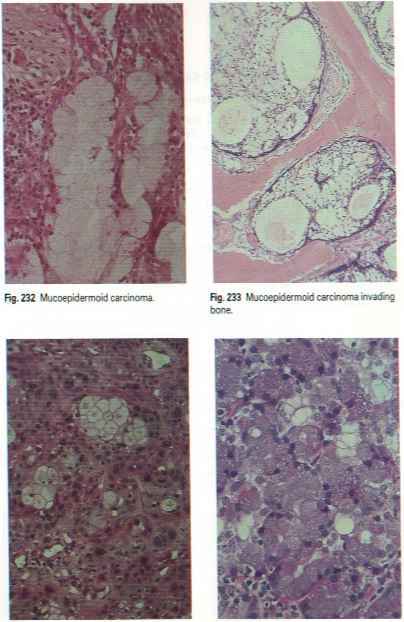 Mucocpidcrmoid carcinoma is relatively benign in some cases but can behave like a typical carcinoma. It forms nearly 10% of intra-oral salivary' gland tumours; most commonly on the palate. Patients are usually middle-aged or older. 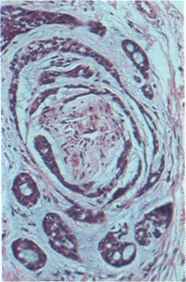 Microscopy The two components arc large, pale, mucus-secreting cells, which typically surround large or small cystic spaces (Figs 232 & 233), and sheets of epidermoid cells. I-ess well differentiated tumours tend to resemble squamous cell carcinomas but for the presence of occasional mucous cells (Fig. 234). Behaviour is not reliably related to microscopic appearances and cytologically benign tumours can be invasive (Fig. 233). Treatment Wide excision is required. Forms only about 2% of intra-oral salivary gland tumours. 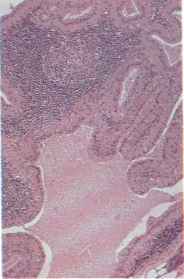 Microscopy Typically a more or less uniform pattern of large, darkly basophilic cells with granular cytoplasm (Fig. 235) resembling serous acinar cells. Often tumour cclls arc in sheets without obvious organization but occasionally in an acinar arrangement. Treatment and Wide excision should be curative, but the behaviour is Prognosis not reliably predictable from histological appearances and even well-differentrated tumours can be invasive. Fig. 234 Mucoepidermoid carcinoma: poorly Fig. 235 Acinic cell carcinoma, differentiated. Forms 13% of intra-oral salivary gland tumours. 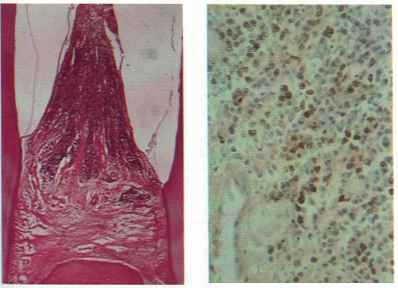 Microscopy Consists of small, dark cells with duct-like 'holes' in a cribriform (Swiss cheese) (Fig. 236) or lace-like pattern, often with hyaline or mucinous changc in the stroma. It has a strong tendency to perineural invasion (Fig. 237) and spread. The tumour is slow-growing but difficult to cxcisc as the borders arc ill-defined. Metastases develop late and radical excision is needed. Form about 12% of intra-oral salivary gland tumours, and mainly affect the over 60s. (Fig. 238) or cysts with papillary ingrowths. Lcss-wcll-differentiated tumours show greater cellular pleomorphism. Undifferentiated carcinomas and squamous cell carcinomas are rare and seen mostly in the elderly. Pleomorphic adenoma can undergo malignant change, usually after years of slow growth, in recurrences and in old fibrotic (scarred) tumours (Fig. 239). Carcinoma in pleomorphic adenoma comprises about 7% of salivary tumours of minor glands but up to 30% of sublingual gland tumours. 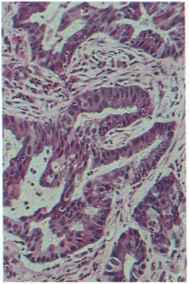 Microscopy Malignant change is usually adenocarcinoma (Fig. 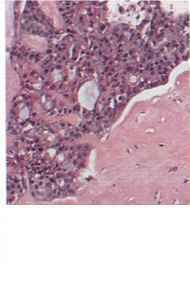 239) or undifferentiated carcinoma with invasion and destruction of surrounding structures, but elsewhere features of original pleomorphic adenoma persist. Fig. 236 Adenoid cystic carcinoma. Ftg. 237 Adenoid cystic carcinoma: perineural invasion. Fig. 239 Carcinoma in pleomorphic adenoma.